Novox for Dogs - Better Form of NSAID? Is Novox for dogs a better form of NSAID? This class of medication works to reduce inflammation and pain in your pet without using steroids, and these drugs can be very effective but also carry some risks and possible side effects as well. Dog arthritis pain relief is essential if your pet has this condition, so that your animal can move without pain and participate in the usual daily activities. Novox for dogs is the generic form of Rimidyl, and these medications use Carprofen as the main active ingredient for treating pain and inflammation. Carprofen was the first medication offered for dogs who suffer from arthritis and chronic pain and inflammation, but there are some serious risks with this medication. Arthritis in dogs treatment will usually mean NSAID medicines, and this entire class of drugs has serious risks involved. Stomach and intestinal bleeding, ulceration in the digestive tract and problems with organ damage involving the liver or kidneys are possible risks with any drug in this class, and this includes Novox for dogs. Without these drugs your pet may have a much lower quality of life as they grow older, but care must be used with any NSAID medication because of the risks involved. A comparison between Novox vs Rimadyl will show that these two drugs are bioequivalent, and Rimidyl has a number of warnings and precautions because the drug has caused death in some cases. Novox for dogs is considered relatively safe for most animals, when used exactly as directed. 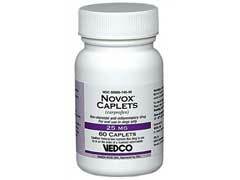 All NSAIDs carry risks though, and Novox can have some serious side effects for some dogs. This drug is not considered a better or safer NSAID than others in this class, but it is a less expensive form of Rimidyl so there are cost benefits. As one of the possible Rimadyl alternatives Novox is not safer or more effective, because the same drug is used in both medications, just cheaper.